With access to over 5,000 markets, tailored price alerts send by text and email, customisable charting tools and seamless integration of mobile and tablet, our trading platforms let you take advantage of every trading opportunity. With access to over 5,000 markets, tailored price alerts sent by text and email, customisable charting tools and seamless integration on mobile and tablet, our trading platforms let you take advantage of every trading opportunity. 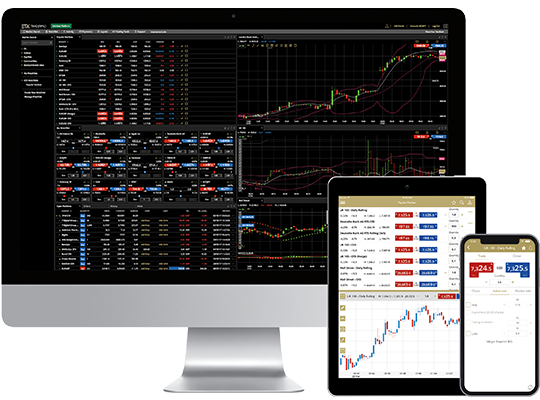 Powerful charting tools, thousands of markets to trade on and fast execution – all on our intuitive flagship trading platform that’s been designed by traders, for traders. Experience trading on the respected MT4 platform from ETX. Expert Advisors, Trading Central reports, advanced technical tools, multiple charts, one-click ordering and hedging tools. ETX Capital is a leading provider of spread betting, CFDs and forex trading services for retail, HNW and institutional clients. *2018 Best Trading Platform, Online Personal Wealth Awards and 2018 Best Spread Betting Platform, ADVFN Financial Awards. †Tax laws are subject to change and depend on individual circumstances. Tax law may differ in a jurisdiction other than the UK. Spread bets and CFDs are complex instruments and come with a high risk of losing money rapidly due to leverage. 76% of retail investor accounts lose money when spread betting or trading CFDs with ETX. You should consider whether you understand spread bets or CFDs work and whether you can afford to take the high risk of losing your money. Monecor (London) Ltd is a member firm of the London Stock Exchange. Authorised and regulated by the Financial Conduct Authority with Financial Services register number 124721. Please note: Binary Options are not a regulated product. 79.6% of retail investor accounts lose money when trading CFDs with ETX. You should consider whether you can afford to take the high risk of losing your money.